Corporate Social Responsibility (CSR) is not just about being charitable and philanthropic. While it’s a nice idea in theory, it simply doesn’t make sense for business. CSR is about strategy. It is about creating value and impact. And doing it efficiently. Whether you are creating social value or business value, you want the most value and impact possible for any set of inputs – efficiency is important. Effective CSR uses strategy to simultaneously create societal and shareholder value. It’s about making your organization stronger, more resilient and more competitive, while contributing to society in a positive way at the same time. One of the biggest mistakes I see companies making when it comes to CSR is not thinking strategically about their own business interests. Many business leaders assume consumers, investors and employees are looking for them to simply give back quick, so they panic, choose a charity, seemingly at random sometimes, donate to it. Some even lock in a an arbitrary percentage of their profits to go toward that good cause. Their approach is to look outside of their business, find what seems to be an important social cause or issue, and contribute to it. With that they think they have made a contribution, they have satisfied society’s expectation and they can go back to their business. What these leaders do not realize is there is a more effective way to go about giving back — a way that can also give back to their company. A way that aligns and integrates interests, creating value and impact for society, and simultaneously creating value and impact for their own business. 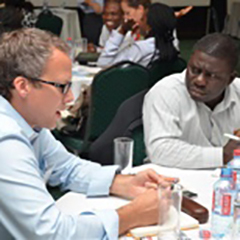 I worked with a beverage company in Africa that was importing most of the raw materials needed for the drinks they produced. The company was under pressure because it was selling in the local currency and paying for its imports in US dollars, which created foreign exchange risk. The company also realized it was having very little positive impact in the local community. The company decided to make a new beer using locally grown and processed Cassava. This not only replaced expensive imports, it also gave them a unique marketing story. The beer did very well in the market, and provided income and impact in local communities. The net result. Income and opportunity for local farmers, enhancement of local Cassava processing capacity and a major development impact for the community. And, for the company; lower costs, reduced forex risks, a unique product in the local market and a staff that was energized by supporting local development. This is just one example that demonstrates how the positive impact a business can make with CSR can be two-fold. It is crucial to look for strategic approaches that can solve a social issue and a business issue at the same time. If not, you will end up in a zero-sum situation where you can be doing social good and creating social value, but at the expense of business value, which is just as important. At CSR Training Institute, we are focused on finding solutions that align business, social and environmental performance. 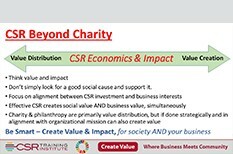 If you would like to learn more about how a strategic approach to CSR can help your business or organization leverage and deliver more value for shareholders and society, email me at wayne@csrtraininginstitute.com.